Descending the staircase into the vaulted cellar, a tall visitor must bend down. 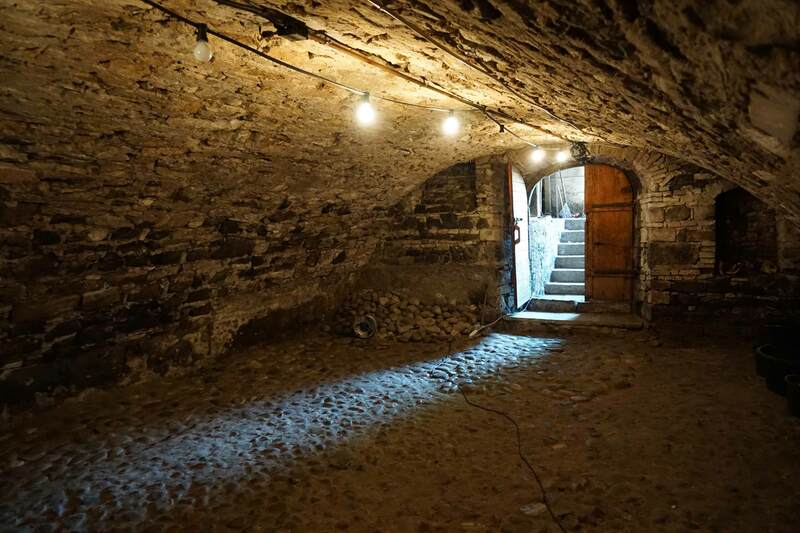 The floor of the two cellar rooms is paved with big Rhine boulders, and one must be careful while walking on the uneven surface. The back wall of the first cellar was filled in to serve as a boundary. Two openings show the bridge leading across the moat behind them. In the next square room to the left, you can see the first phase of the house’s construction (second half of the 17th century). It contains not only the original entrance to the house but also part of the medieval town wall, erected in the 14th century. The stonework consists of layers of brick and volcanic quarry stones. In the right-hand corner, a pedestal (30 to 40 cm high) is visible, solidly baked to the ground. It was left in place to demonstrate what the cellar was like with the complete filling when the Foerderverein bought it. Only when this “blanket” was removed did the old stone floor and drainage trench reappear. Dedicated pupils and students from Germany, the USA and several eastern European countries uncovered these foundations in several stages while attending volunteer camps run by Action Reconciliation Service for Peace between 2002 and 2005. We are extremely grateful to them. Here, the history of the house can be traced. Archeologists of the Baden conservation office assume the room was used as a cellar for storing and cleaning barrels.